Add foot to my order. LifeFence.com is offering Sentry Safety Pool Fence EZ-Guard pool fence product line. EZ-Guard is the new standard in safety. Select your preferred fence height/color and enter the amount of feet you need. EZ­-Guard pool fence provides a full kit for your DIY installation. Learn tips on ordering EZ­-Guard pool fence. We’d be happy to help you select your pool fence or answer any questions you may have. We have large amounts of EZ-­Guard pool fence available in stock. In most cases, we’ll ship the next business day after you order. Child safety is a priority. With a properly installed pool safety fence, you can take control of a potential hazard on your property. As a very real threat, an unprotected pool can quickly become a drowning risk to toddlers, children and even pets. To meet your family’s safety concerns, LifeFence.com is offering Sentry Safety Pool Fence EZ-Guard pool fence product line. It comes in portable sections with poles pre-attached along with all the materials needed to easily construct your fence. The sections are either 12 feet long (for the 4’ tall) or 10 feet long (for the 5’ tall). EZ-Guard is the new standard in safety. The stainless steel rods contained inside each pole is what makes EZ-Guard stand out from competitors. Unlike traditional aluminum poles, which can break after time or constant usage, stainless steel can be bent and straightened hundreds of times without worry about breakage. Also because of the stainless steel rods, the resulting drilled holes are smaller. When the fence is up, the holes are not visible giving a clean installed appearance. When the fence is down the holes can be capped (caps are included with your purchase). The smaller holes in the deck mean an easier install process because just a regular hammer drill will get the job done. Quick, easy drilling is also assisted by the provided template guide. With little experience required, you can do it yourself and save. 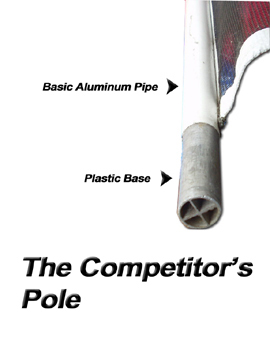 Traditionally, installers will use a few different styles of all aluminum poles with different reinforcement styles; and whether they are x reinforcements or tri-sections or any other style of aluminum reinforcement they all share a common flaw, they snap from impact or over time as one removes and reinserts the poles (i.e. when the fence is removed for storage, parties, winter, etc). This is because aluminum does not have the strength or resilience of solid stainless steel. These breaks occur on the traditional poles where the pole meets the pool deck. Because of this known flaw in traditional installed pool fence, they can pose a danger to your family''s safety. However at that same point where the pole meets the pool deck on the EZ-Guard poles you’ll find a half inch solid stainless steel rod, reinforced with PVC. Stainless steel can be bent and straightened hundreds of times without worry about breakage. LifeFence.com is currently offering a great deal from the Sentry Safety Pool Fence company. Sentry Safety Pool Fence, as one of the world''s largest fencing manufacturers, produces fencing to be sold retail to the public under the Sentry Safety brand and then also produces fencing for contractors to sell without their own label. As this pool fence season winds down, LifeFence.com has been offered the Contractor Grade fencing to sell to the general public to help move some excess inventory. The mesh, poles, concrete sleeves, stainless steel rod, hook/eyes, and most importantly ­ the warranty, are all the same as the 4 foot tall EZ-­Guard. It is only missing the tag indicating the Sentry Safety brand. "The Sentry Safety brand of pool fences will help protect your family from accidents around your pool. 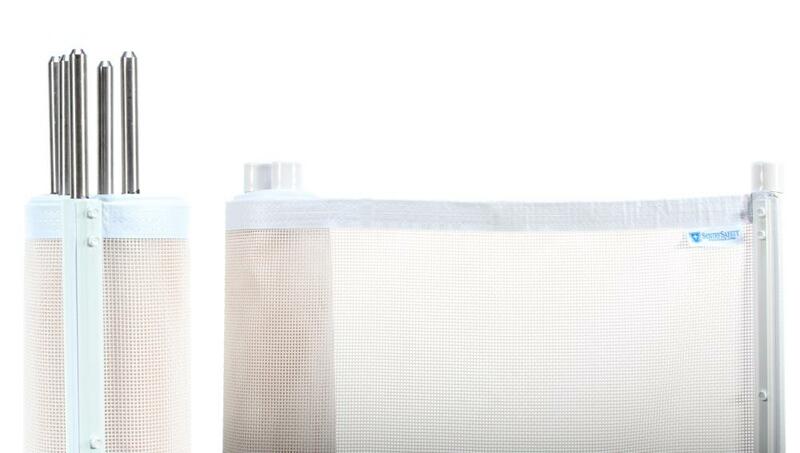 These pool safety fences are built to a high quality and are made to last. The Sentry Safety brand of pool fencing comes in two models: EZ Guard and Visi Guard. These are available in either 4 foot tall and 12 foot long section or a 5 foot tall and 10 foot section. One of the unique shopping features of both DIYPoolFence.com and LifeFence.com is that you can order the exact amount of fence you need for your unique pool application. We do this so you do not have to order any excess pool fencing material. The fence mesh is attached to aluminum poles. These poles feature solid stainless steel rod that is less prone to breaking from repeated removal. When the mounting portion of the fence pole is made of aluminum it is prone to break and deform due to metal fatigue. This fatigue comes from the continual insertion and removal of your fence posts. The stainless steel rod at the end of pole also makes this a great DIY safety pool fence kit. Because the diameter of the rod is smaller than the traditional mounting pole it only requires the use of a hammer drill and masonry bit, both of which we rent. Because the stainless steel rod''s diameter is smaller than the diameter of the fence pole, it will create a seamless look between your pool deck and pool fence. This will enhance the look of your pool fence. Each fence section comes with a sleeve and a cap for each fence pole and a hook and eye to attach between each section. 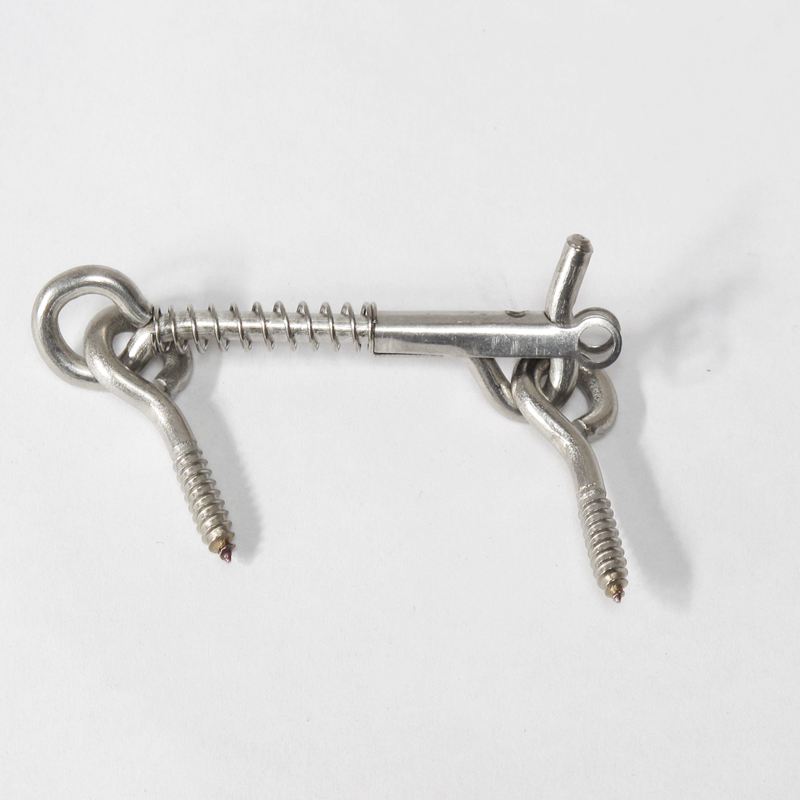 You can purchase a simple pad lock that can add additional safety to each hook and eye. Additional hook and eyes are available for purchase as well. The installation template is built right in the box of each section of pool fencing. Simple cut out the template and pop out the perforated holes that you can use to mark the locations to drill for your fence poles. At DIYPoolFence.com and LifeFence.com we offer installation tool rentals. For only $10 you can rent the hammer drill, alignment tool, and masonry drill bit. Our alignment tool is very unique. It allows you preset any angle (0*, 2*, and 5*) to help keep your fence taut and looking great. Also our alignment tool has a built in bubble level that will help you make sure the alignment tool is level with the earth. Each tool rental comes with a prepaid return shipping label. When you are laying out your pool fence, you are going to want to angle and corner away from your pool. This will help keep the fence material taut. When you attach all the sections of fencing material together will be adding tension to the poles. If you do not angle the corner poles away from the turn, the tension will pull the pole into the corner. DIYPoolFence.com and LifeFence.com also have available a self-closing and self-latching pool fence gate that is a popular accessory. This gate will ultimate peace of mind that your pool fence is secure. Both DIYPoolFence.com and LifeFence.com have technical support standing by 7 days a week to help you plan out and answer any questions you may have." "Sentry Safety pool fences will help give you the peace of mind that your children will be safe around your pool. These fences are built to the utmost quality and will provide you with lasting safety. Sentry Safety pool fences are available in two different models: EZ Guard and Visi Guard. Both of these pool fences share the same aluminum and stainless steel pole. Also these pool fences can be ordered in your choice of color. We offer these pool fences in: black, white, tan, and green. There is also an option for a 5 foot tall fence as well. There are a few difference with these two fence models. The Visi Guard has a knotted mesh that is more transparent and when you order your desired color only the pole and border are color matched. The reason why we do not color the mesh on the Visi Guard is to maintain its higher transparent properties. The EZ Guard line of pool fences have a tighter basket weave mesh. The mesh on the EZ Guard will come in the color that you order. Also the top cap on the pole on the EZ Guard is different from the Visi Guard. The EZ Guard feature a rubber cap that will help you remove the fence. You can purchase the Visi Guard pool safety fence at DIYPoolFence.com. The EZ Guard can be purchased at LifeFence.com. DIYPoolFence.com and LifeFence.com are dedicated to helping you provide extra safety and security to your family. We have technical support 7 days a week and will help you put together a compete package for you." Ordering from LifeFence.com is simple. The color you select will be for the mesh, pole and lining. Your color options for the lining and poles are:4’ Black,4’ Forest Brown ,4’ Desert Tan,4’ Lanai White, and5’ Black. How Many Feet Do I Need? The best way to plan your ordering quantities is by laying out your pool fence first. To do so take a hose, strand of yarn, rope, or anything else long and flexible and lay it out in the shape you wish your child safety pool fence to form. Take into account all the turns and curves the fence will make when using the flexibility of the measuring rope. Then mark a beginning and end point on the rope for the fence, if the fence makes a full circle the beginning and end will be next to one another. Lastly pull your rope straight and measure what the full distance of you child safety pool fence will be. When planning to order, simply measure your intended fence line then enter the length on LifeFence.com in the quantity area of the shopping cart, add any extras you may want (the fencing kit itself is complete with all the poles, sleeves, caps, and hook and eyes for basic installation) and LifeFence.com will take care of the rest. We are the only site on the web that prepares your complete DIY pool fence kit for you. You can even rent our exclusivedrill, bit and drill guide package for just $10 per weekend! These tools work together to help you get the job done accurately and quickly! High "lifetime warranty" quality and unsurpassed strength featuring solid stainless steel pole cores at pressure points. Absolute lowest price on a DIY safety fence because of the container quantities we purchase enabling us to pass the savings on to you! An online installation video you can view 24 hours a day. Fast delivery. Most orders ship out in 1-2 business days! View customer photos of EZ Guard installations and learn more on how to earn a 5% rebate on your pool fence purchase. The child safety fence poles are completely rust proof. The outside layer is durable baked-on TGIC powder coat finish aluminum, followed by a PVC insert spanning approximately halfway up the pole, and finished with a stainless steel rod that goes in the ground. Where the pole meets the ground is the focal point for all child safety fence poles, meaning if force is exerted on the pole that point is where the force will have the most impact. In fact, the poles can withstand 200 lbs. of pressure. You can rest assured you have the toughest child safety fence around because at that ground point contains aluminum, PVC and a rod of solid stainless steel, making all three the strongest combination available.Sentry Safety Pool Fence EZ-Guard pole design also means smaller holes and less of a scar on the face of your pool deck. 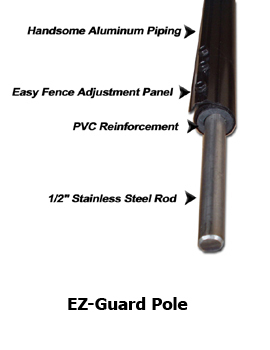 Each child EZ-Guard pool safety fence pole comes topped with an EZ-Grip rubber cap. Not only is it a durable top to protect the finish of your pole when the child safety pool fence is laid down but it also gives you an EZ gripping point to squeeze the poles together and release the tension so you can unhook your hook and eyes. Our child safetypool fencing is has absolutely no finger or toe holes for climbing and is also UV resistant to withstand the beating sun. The top and bottom come with double-side protection using multi-stitching of the fencing material. This works to prevent any possible threading of the fence at its edges. a) You’ll order fence by the foot. Your pool fence will arrive in twelve-foot sections and if the length ordered is not a multiple of twelve the last section will be less than twelve. Example: If you were to purchase of 27 feet you would receive 2 twelve-foot sections and 1 three-foot section. b) A pole comes pre-attached to every three feet of fence purchased for the 4 foot high or every two and a half feet for the 5 foot high fencing. You''ll need to end your fence with a pole. If your end measurement is not a multiple of 3 than you would need to purchase an extra pole. 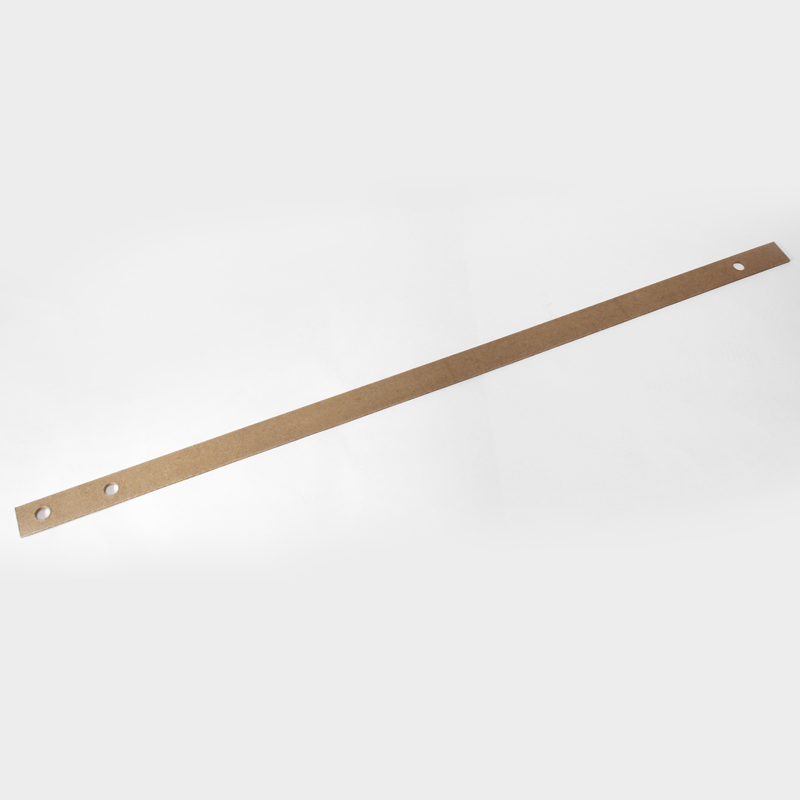 Due to LifeFence.com’s easy ordering process, this extra pole will automatically be added to your shopping cart. Example: If you were to purchase 25 feet you would receive 2 twelve-foot sections and the first pole of the one-foot section. The second pole of the one-foot section would need to be purchased separately along with an extra ground sleeve. Remove the backing of the pole that is sandwiching the mesh to the pole. Move the pole over to where it is needed. 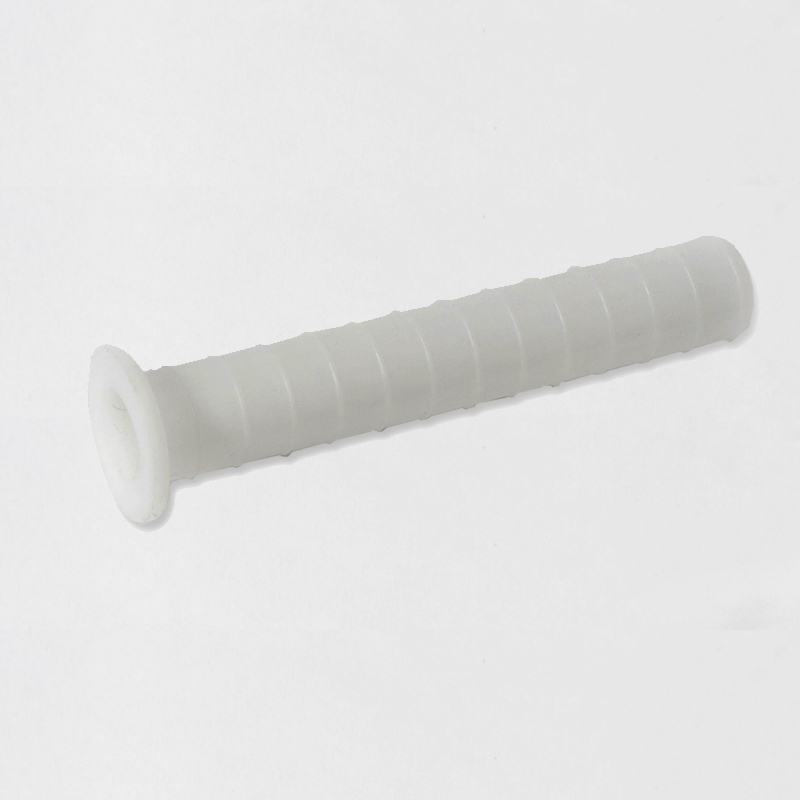 Re-sandwich the mesh between the pole and the backing and screw in the stainless steel screws. c) If you are planning to go up stairs you will need two poles per every step, plastic ground sleeves for the poles and spring-loaded hook & eyes to connect the poles. Example: If you have your base level, one step, and the upper level you will need a pole at the edge of the upper level, 2 poles for the one step and a pole at the beginning of the base level. Then you will need two spring-loaded hook & eyes; one to connect the pole at the top level with the first step pole and the other to connect the pole at the end of the step with the base level pole. You will also need plastic sleeves to go with each extra pole. To purchase these additional items browse the accessories page. d) If you are connecting to two walls or barriers instead of a full circle around the fence please order an extra hook & eye. Also if one of your sections is less than 12 feet you will need an extra hook and eye. We have large amounts of EZ-Guard pool fence stock available and in most cases, we’ll ship the next business day after you order! This enables you to control the timeframe of when your pool fencing arrives and not having to negotiate with an installer’s schedule during peak times. Even with this quick shipping process our suggestion is to plan ahead as far in advanced as possible. With LifeFence.com you can easily order your fencing materials and but delay the tool rental to show up at a later date when needed. Why is this delay a good idea? Most people know well in advanced that their children will one day need protection from the pool or that they are moving to a new home with an unprotected pool. This safety fence, even when in stock, can sometimes be subject to delays because of the nature of shipping it. It usually comes shipped in multiple boxes, each of which can be heavy. This means express delivery will be out of most people''s acceptable price range and the more packages the more chances for the delivery service to have one that becomes delayed or lost. The tools on the other hand are in one small box and can be shipped express if needed fairly easily, so getting the fence early and the tool(s) when needed is the smart way to go. We advocate and support people taking the fence installation on as a Do-It-Yourself project; however some people like to hire local handyman services to do the job. If scheduling hired help, it is always best with any project to wait until you have all materials and tools in hand prior to scheduling. Do not rely on the tracking numbers; wait until the packages are actually there in hand. This avoids having to reschedule or having them show before you are ready for them. If you have tool rentals for them to use, plan with us first to have an extended time frame. LifeFence.com is here to help you with your purchase, from ordering to installation just because it’s a DIY project doesn’t mean you’ll all on your own! We’d be happy to help you select your pool fence or answer any questions you may have; learn more about the variety of ways you can contact us.